The planet of Olympus has been destroyed forcing the Olympians and Titans to live together in peace. Any contact with humans is banned. When a Titan named Astraea finds a human, she discovers a plot to take over both the Titans and the Olympians. With her group of mythological friends, they must use their brains not just their brawn to stop the invasion before it's too late. Who will triumph? I can't wait for the next book in this series to come out. 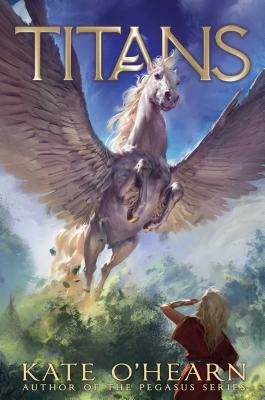 A group of kids must stop invaders before they take over Titus—and the rest of the universe—in this first book in a brand-new series from bestselling Pegasus author Kate O’Hearn, who masterfully blends mystery and mythology together. Astraea is a Titan, granddaughter of Hyperion, and now a reluctant student at the brand-new school, Arcadia. She just knows that it’s going to be awful, and that there is no way that Titans and Olympians will ever get along! At least she’s got her best friend, a winged-horse named Zephyr, to keep her company. Then the night before the first day of school, Astraea hears her parents discussing something terrifying: a human has been spotted on Titus. But that’s not possible. All routes to Earth via the Solar Stream have been closed—no one can travel between the two worlds…or can they? When Astraea and Zephyr get detention on their first day—for fighting with a centaur—they’re sent to the orchards to harvest nectar. There they discover a human boy named Jake. How he got to Titus is a mystery to him and to them. They have to get him home before anyone else discovers him. But what the trio uncovers is something much bigger than one human boy. It’s a scheme to take down the rulers of this world, conquer it, and then do the same across the galaxy. Can a group of kids stop the invaders? Or is Titus, like Olympus before it, doomed? Kate O’Hearn was born in Canada, raised in New York City, and has traveled all over the United States. She currently resides in England. Kate is the author of the Pegasus series, the Shadow Dragon series, and the Valkyrie series. Visit her at KateOHearn.com.